We are nearing the end of the challenge and I'm starting to feel a little wiped out from it all. Or maybe it's just because I have a head full of snot from yucky spring cold! Either way, I went with an easy mani for this one. 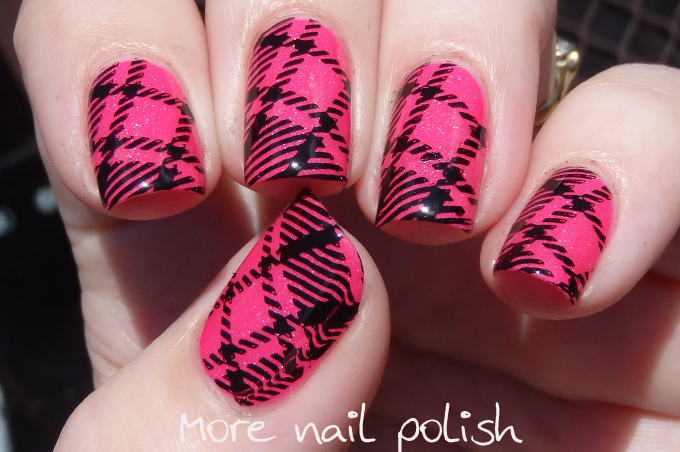 Simple pattern stamping over a gorgeous polish. The pattern I've chosen is tartan or is it plaid? I dunno I get those two confused. Anyway it's an easy stamp that looks great. This design is from Born Pretty Stamping plate QA96. It stamped really nicely for a cheap plate. I used Mundo de Unas Black stamping polish. My base polish is a new collaboration shade from Picture Polish called Sizzle by Cosmetic Sanctuary. Here are some bonus swatch photos of Sizzle. This a a stunning bright and saturated pink crelly polish with a subtle holo. I'm not completely sure if this is the bijou holo or the other fine scattered holo flakes, but the holo appearance in this one is less noticeable than in the other scattered holos by Picture Polish - not that that takes anything away from this polish, as it's a delight to to put on and such a fantastic bright colour. What a great pattern! It looks great with the colour scheme you've chosen.